A man (Charles, Timothy Earle) discovers that his brother he hasn't seen in years has died, but soon afterward a puzzling letter arrives. It appears his brother wasn't physically buried and the letter contains strange code. Meanwhile at a gas station what amounts to a mass murder occurs of everyone in the vicinity (including children) slaughtered by a heavily-armed strike team. In the distance, a man captures the entire incident on video. Through some networking, Charles gets in touch with a reporter who might know something about the codes and has a copy of the tape. Before they can meet the reporter is gunned down with Charles narrowly escaping, but he manages to recover the video. With an assassin around every corner, Charles follows a trail of clues to a large industrial complex. Sneaking in, he finds his brother drugged, but is quickly captured and tortured for information. Refusing to give in, Charles breaks free from his constraints in the night and rescues his confused brother. Escaping into a nearby forest with the entire force in hot pursuit; they must rely on their skills to face off against an army of "perfect" soldiers. Though is Charles' brother quite over the trauma of his ordeal? Quite a consistently entertaining Swedish indie actioner in English. The action is extremely fast paced and way over-the-top. Blood squibs explode with absolute glee (no kidding), vehicles tear asunder like they're packed with C4, and as mentioned no prisoners are taken. The direction can be summed up easily; it's as if Peter Jackson directed this right after Bad Taste. The film is brimming with odd angles, sharp edits, and heavy use of color tint. 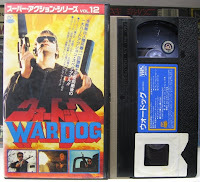 This film reminds me greatly of Darren Ward's great Sudden Fury, as in both features attempting and succeeding at melding thrilling, hard action with a story with a bit of emotional weight. The third act is the most satisfying in its unexpected twists, but the action earlier is guaranteed to please genre fans. It's wild, rough around the edges, and completely awesome.